Key potential buyers will be airlines serving islands with short runways, ATR head of region, Asia-Pacific, Christophe Potocki said. The new version, the ATR 42-600S, is being designed to fly from 800-m (2,600-ft.) runways. ATR is looking to achieve this without great development expense. Changes are being made to operation of flaps, spoilers, the rudder and brakes. Potocki said empty weight will be reduced by installing lighter seats and galley fittings—but not by altering the structure. The market for 800 aircraft is estimated by including all aircraft with 20–42 seats. Cargo delivery into locations with only short runways is also seen as a source of demand. No precise number of aircraft in the launch orders is needed; rather, ATR will consider the quality of the customers, as well as the size of their commitments. The manufacturer is looking for a mix of airline and lessor customers, Potocki said. Orders could be announced at the Paris Air Show and a first delivery made 2–3 years after the launch of development, he said. Earlier this decade, ATR,, owned by Airbus and Leonardo, studied how to offer a larger turboprop; it finally decided not to do so, but the possibilities indicate what may eventually emerge. One option was to further extend the aircraft from its ATR 72 length, which is sized for 70 economy seats at 30 in. pitch. Stretching is usually relatively inexpensive, but the ATR is already close to a hard limit on body length: it has a required rotation angle, which the short main landing gear cannot provide if the fuselage is too long. Three rows, and therefore 12 seats, can be added to the ATR 72—but no more without unacceptable reduction in the maximum tilt of the aircraft on takeoff, Potocki said. Getting only three rows may be desirable, but Potocki added that even that modest stretch would demand more power and therefore costly engine development. The ATR 72 is notable for its high (and economical) power loading: 6.2 kg per kW (10.2 lb. per hp.) at gross weight. Evidently, this can barely be pushed higher. The type uses the Pratt & Whitney Canada PW127 engine. The other path to offering larger capacity was developing a new type, called the New Generation Turboprop (NGTP). Potocki said it would have had a body sized for five-abreast economy seating. Although some five-abreast aircraft have around 90 seats, that width is also associated with maximum seating well above 100. Airbus opposed development of the NGTP, noting that the ATR 72 was already dominant in its market. 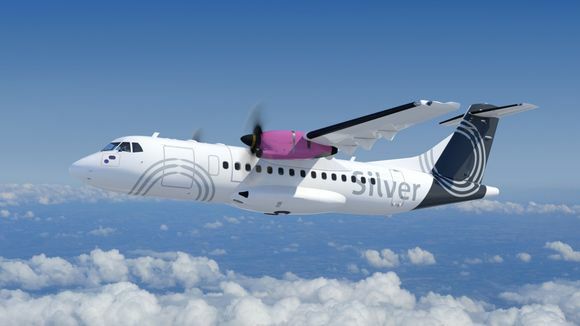 A larger aircraft is, however, coming to the turboprop market—from Avic. The Chinese state company’s MA700, due for first delivery in 2022, is sized for 78 seats at 31 in. pitch. This entry was posted in News and tagged 42, 42-600, 600, ATR, launch, Order. Short. Field. Bookmark the permalink.